I've already mentioned my love of Baby Gap for baby boy's closet essentials and today I couldn't resist sharing the best of their sale with ya'll. One of my favorite things about Baby Gap is the amazing selection of boy gear that doesn't necessarily scream boy in a cheesy way. Aaaaaand, best of all, they are always having a sale. I never purchase anything from the Gap companies full price - ever. Ok, with the exception of one thing that I had to have...and I'll show you that in a minute. Anyway, these are my fave items in the current clearance section of Baby Gap online. My own store has a rocking sale rack that calls to me and the selection rotates constantly, so how can I not swing in there all.of.the.time. I can't wait to squish him into it this Fall! 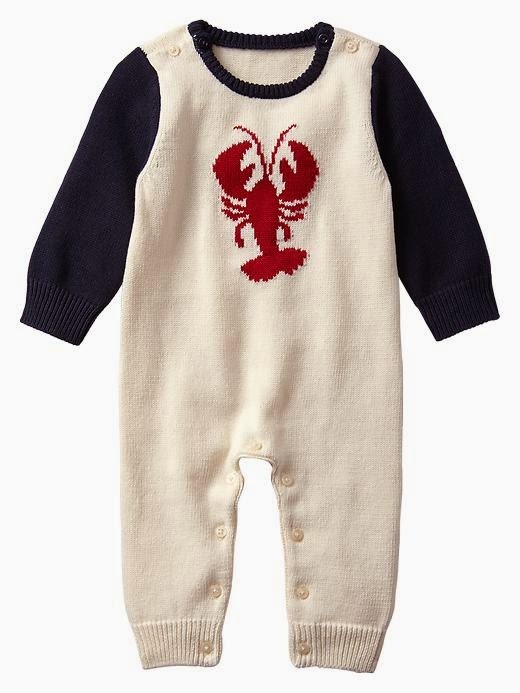 The Lobster Onesie is the crowning jewel of the new Tidal line for Spring/Summer...if you have a bambino on the way, go check it out! I just did some serious damage at the Baby Gap clearance rack. I am still in my first trimester and vowed that I wouldn't buy anything until 15 weeks. Totally broke that. They have Christmas stuff for $4 and under which totally did me in. I am blaming my hormones. Oh too cute that little lobster onesie. I have a Gap by my office that doesn't get a lot of foot traffic so I manage to find some really adorable things marked down. I may or may not have bought out all of the girl paddington bear line. I mean doesn't every baby need a polks dotted poncho?! Baby Gap is dangerous! we welcomed Zoe this winter and I am so obsessed with everything! Congrats and happy shopping!